Spanish Driver's License - Chicago IT Systems, S.L. I passed my driving exam and am now a licensed driver here in Spain (and the rest of the European union). In the states such an event would not be worthy of a blog entry but the system here is so expensive and challenging it’s nearly worth an entire web site. If you’re thinking of moving here and you do not belong to the European union, your current driver’s license will be valid for 6 months, after which time you’ll need to get a Spanish one. Unlike in the states, to get one, you’ll need to sign up for classes at a driving school because to take the driving test, you need to use a specially equipped car (with pedals on the passenger side) and you need to be accompanied by someone authorized to accompany a non-licensed driver on a test, and the only reasonable way to organize that is by signing up for classes at a driving school, even if you’re already a good driver. The written test is at least 10 times harder than the tests in the U.S. and written in such a way that it is easy to fail. The actual driving test is also quite stressful, although not nearly as hard as the written test. In my case the total cost of getting my license, between school and testing fees, was around 360€ (about $400), and that is considered cheap for most people. Each time you go for a practice drive it costs 22€ ($25) and most people are required to take at least 15 classes before being allowed to take the driving test. I only had to take 4. With all the schools and difficulty of passing the tests and the high costs involved one would think that there are great drivers here, but one would be mistaken. It has been my impression that the average driver here has much less respect for the law than the average driver in the U.S. They speed, tailgate, run red lights, drive under the influence, talk on their cell phones, honk and waive their hands uncontrollably and park wherever they feel like it, frequently double-parking or blocking the street entirely to take care of business. Furthermore, although I’ve never compared fatalities between Spain and the U.S. (or even just California, which would be a more realistic comparison), it is my impression that fatalities on the road are quite high. 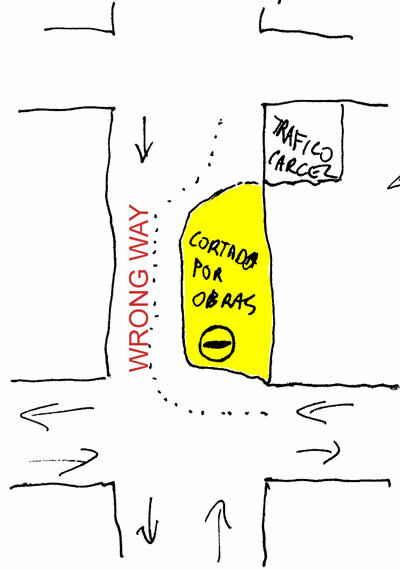 My patience was put to the test when, on the morning of my written test I saw the following just outside the test center: (the square labeled “Tráfico Carcel” – which translates to Traffic Jail – because the place looked like it was once a detention center). This is a graphic of a road with one lane temporarily closed due to the construction of a building on that side of the street. The dotted line shows the route drivers were taking when confronted with the lane closure. In the 15 minutes I stood outside waiting for the jail, eh, test center to open, I saw at least 20 cars drive the wrong way down what had become a one-way street. I love the Spaniard’s practical nature: it was a short stretch of street (just over 100 meters) and the detour added at least 2 minutes to the trip. Maybe the authorities should have required the construction company control traffic. Just closing the lane appeared to be insufficient. On the other hand, imagine my frustration at seeing such flagrant disrespect for the law just as I’m about to be fully subjected to it. Now that I’ve passed all the tests and jumped through all the hoops I don’t have a problem saying this whole process seems to be an obvious waste of everyone’s time and they should just charge a higher tax and follow a different, more direct system for authorizing drivers. The current approach is totally artificial and does little or nothing to imrpove the quality of the drivers or safety on the road. Bottom line: If you are going to get your driver’s license here, focus, don’t get brought down by the reality of the situation, study, and try to do the whole process in as short a time as possible (which in my case was just under two months – which is also really rare – most people spend six months). You might also find signing up for this web site very useful: todotest.com I took my classes with Autoescuela Mutua where the people were very friendly and the prices affordable (but their web site could be improved). I can recommend them. BTW, I had to wait between 15 minutes and an hour (which was the case when taking the driving test) before being allowed to take the tests even though I had signed up for a very specific day and time, days or weeks in advance, thus adding credence to the “Spanish are always late” stereotype. Signed up for classes at local driving school – 80€. Went to a couple of classes, did some online tests at todotest.com, lost interest (got distracted with the business) and put on a back burner for nearly two years. Study as best you can for the test (only 20 questions, but many can be tricky). I found a driving school that sold a couple of books with lots of sample tests (another 20€) that I found very useful. Arrived at the testing center, the one that looks like it used to be a jail, at 8:45 am. The test was scheduled for 9:00 am. The doors opened shortly after 9:15 am. There were at least 100 people just standing around in the street waiting for the doors to open. We were hearded into a waiting area while the called our names out. I was first (which I found to be a little odd). I was given my answer sheet and directed to sit in the seat at the far end of the room. There was a test sitting on my desk (on all the desks) and I was instructed to place the answer sheet on top of it until the test began. Does this remind anyone else of high school or just me? Reviewing the answer sheet, I realized my name was misspelled and made a note to self to mention it at the end of the test, which I did, and the proctor told me to mention it tomorrow when I went to pick up my results (yes, a computer generated answer sheet that takes 24 hours to correct – forget about getting the result in the same day, and much less from the same person). The proctor for the test was nearly incomprehensible, mumbling the instructions and speaking to the back half of the room. Original DNI (Spanish Identity Card – kind of like a driver’s license or social security card in the U.S.) of the seller. You cannot present a photocopy of the card. You must have the actual thing (or the seller must go with you to Tráfico). Go to Hacienda (the IRS) to pay a 7€ tax. Tráfico and Hacienda are on opposite sides of town. Be prepared to pay 0.23€ for the form to pay the tax. Yes, they charge you a fee just for the piece of paper you need to fill out so you can pay the tax. The next day I learned I had passed! There is no testing facility where the tests start. People just congregate on the corner waiting for the teacher and examiner to show up. The tests are conducted in the same car you practiced in. You are accompanied by your teacher, the examiner, and possibly another student. Tests take about 20 minutes and include parallel parking, double stops, round-abouts, and a series of other peculiar tasks. My test was scheduled for 9:45 am. The teacher was running late and arrived just after 10:15. The examiner arrived around 10:45. My test started exactly one hour late! While waiting a girl sat down on a bench next to me and started crying, shedding real tears. It’s hard to tell if it was because she had just failed or was just so stressed out she couldn’t hold it in any longer. I was in a car with another student. He went first and accidentally ran a red light (tricky because if the light turns red while you are in the intersection, depending on the situation, you may be required to stop in the intersection and wait for the light to turn green again – he just went through and in this way ran the red). He failed at that moment and then it was my turn. I completed the test without incident. And now that this is all documented, I’m throwing away all my notes and getting back to work. Hey, I am thinking about trying to get a driving licence in G.C, I have been living here for 4 years, and am fed up of catching taxis and buses everywhere, i was just wondering though, i have ordered some books(in english) to study, but would i be able to do the written exam and practical exam in english??? I can understand and speak spanish fairly well, but just wondered if you knew the situation with the language barrier. It is my understanding you can take the test in English. Go to one of the bigger schools for more information, though: Mutua, Via4, María del Carmen de Benítez to name a few.